LG has taken CES 2019 to announce a wave of new partnerships with major US tech manufacturers, including announcing that Apple AirPlay is coming to its 2019 wave of TVs. 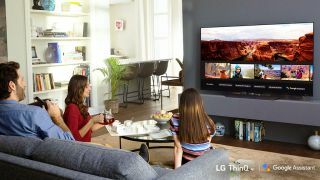 Working with the Cupertino company, LG TV owners will be able to stream video from Apple's library of iTunes TV and movie content, with support for both Dolby Atmos and Dolby Vision standards for a premium home cinema experience.. It's a rare partnership for Apple, which has usually reserved this sort of support for its own Apple TV hardware. Want to talk to your TV, but don't want to be locked into just one voice assistant? LG is also combining both Google Assistant and Amazon Alexa smart controls into its 2019 range of ThinQ TVs. LG smart TVs will let you run both Amazon routines and Google Assistant commands in one set, letting you get the best of both smart ecosystems without having to commit to just one. If your life is entwined with Google's services, you can have Assistant pull in information from your Google account, while Alexa can take charge of your voice shopping experience. Both, naturally, can take command over a host of smart home devices too. Contextual knowledge from the LG ThinQ AI assistant will also intelligently weave the assistant's together, remembering previous commands so that you can talk in a more natural way to trigger previously or regularly used commands.